In business for over 25 years, Patio Place has become Fountain Valley's preferred source of competitively priced, brand name patio furniture, barbecues, fire pits, fire tables, umbrellas, bar stools, gas logs, lava rocks, protective covers, and more. We are authorized dealers for the names you trust (Alumont, Hanamint, and many other) and can negotiate some of the best deals in Orange County. We offer the latest collects and closeout deals on the previous year's models, which make it easy and affordable to furnish any property in Fountain Valley. We can deliver most of our inventory the same day you buy it, and offer cost-effective repairs and refinishing options for patio furniture, patio umbrellas, and barbecues. As a family-owned business, we always put your best interests first. That's why we offer honest, expert advice for everything we sell, as well as affordable solutions for decorating your Fountain Valley outdoor spaces and repairing existing outdoor furniture and equipment. Much of our inventory is available for 50% less than its original price, and our low-cost repairs offer long-lasting results as we use top-quality parts and components. Our refinishing treatments will not only enhance your patio furniture frame colors, but also protect them from damage for years to come. 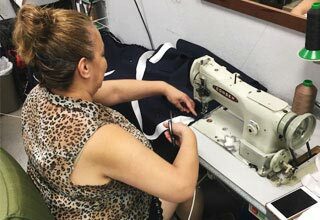 Moreover, our custom-fabricated replacement outdoor cushions, pillows, and slings are made from quality outdoor fabrics, including Sunbrella, Phifer, and original patio furniture manufacturers. These fabrics are warrantied for years against damage and available in over hundreds of color, pattern, material, and thread options so you can recreate your patio furniture's original look or give it a complete makeover. We even stock common barbecue replacement parts from Fire Magic, a leader in the barbecue and outdoor grilling industry. With all that we offer, it's no wonder that we have been the preferred choice among thousands of customers in and beyond Fountain Valley. Call us today and speak with one of our friendly sales staff. We also invite you to visit us at our conveniently located showroom located at 845 Baker Street (between Bristol and Bear) in Costa Mesa, CA. Fountain Valley customers can count on us for low pricing on all kinds of brand name patio furniture, including wicker, extruded aluminum, and cast aluminum outdoor dining tables and chairs, deep seating, sectionals, lounge chairs, chaise lounges, loveseats, sofas, benches, bar stools, lounge beds, swings, ottomans, and more. 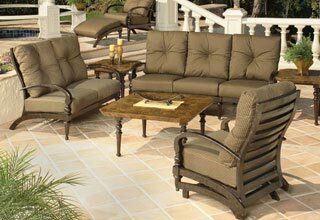 Whether your Fountain Valley deck, patio or other outdoor space is large or small, commercial or residential, we carry discounted patio furniture from Sunset West, Patio Renaissance, and other leading patio furniture brands. We also offer same-day delivery service throughout Fountain Valley so you can enjoy your patio furniture the day you buy it. Visit us today and view our huge collection of attractive wicker, extruded aluminum, and cast aluminum patio furniture for Fountain Valley. At Patio Place, we offer brand name fire pits, fire tables, and bar stools for the best prices in Fountain Valley and beyond. Our wide selection comes from the market's top manufacturers: Hanamint, OW Lee, Alumont, and others. 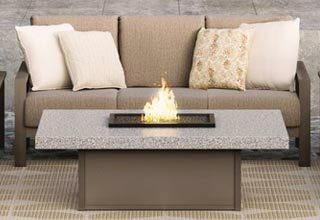 Our fire pits and fire tables are available in various styles, designs, and materials, such as cast aluminum, granite, marble, slate, and more. We also sell common fire pit accessories, such as ceramic gas logs, reflective fire glass, and decorative domes, as well as attractive bar stools and other patio seating. Our bar stools will perfectly complement your new or existing fire pits, and come in extruded aluminum, cast aluminum, and wicker designs. Call us today to learn more. Providing shade to outdoor spaces throughout Fountain Valley, from small apartment patios to expansive golf courses, our patio umbrellas come from manufacturers you trust: NorthCape, Treasure Garden, Galtech, and others. 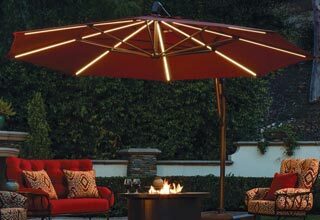 Our patio umbrellas are available in auto tilt, cantilever, easy-track, push-to-tilt, side-post, and other styles. We carry umbrellas with lights, as well as countless umbrella fabric and base options. We can also custom design your patio umbrella to feature your business name or logo. Call today to learn more about our patio umbrella selection as well as our silk screening, restringing, recovering, and rib replacement services for patio umbrellas. Fountain Valley commercial and residential customers turn to Patio Place when they want the highest quality BBQ grills and gas logs for the lowest prices. We sell the market's finest barbecues and portable grills from Fire Magic, as well as top-of-the-line gas logs from R. H. Peterson. We also sell barbecues replacement parts, such as range hoods, access doors, and ranges, as well as kegerators, fridges, and other outdoor cooking equipment. In business since 1989, we can answer all of your barbecues and gas log questions, and help you to find the perfect model for your needs and budget. We'll even arrange for same-day delivery to your Fountain Valley home or business. We welcome the chance to exceed your expectations, so call or visit us today.